Overwintering locations of the salamander Hynobius kimurae inhabiting Mt. Iwatake-yama (1289.6 m elevation), Hakuba-mura, Nagano Prefecture, Japan (photographed on 5 November 2005). (A) Clouded Mt. Shirouma-dake (2933.1 m elevation) that was afforded from skiing areas around the top of the mountain. 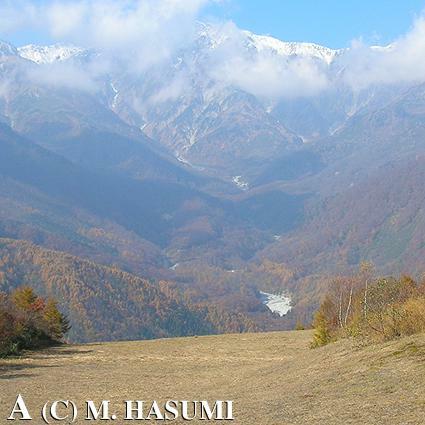 We can see several white portions of a dry riverbed of Matsu-kawa River in the middle range of this photograph. (B) An approximately 480 m-long rocky stream (water temperatures = 7.0-7.1 C, water pH-data = 7.1-7.8) for hibernation and the succeeding breeding of H. kimurae. At the time of examination, 11 males, 5 females, and 9 larvae of this species were each hidden under a stone in the water. There were 1 male and 1 female near the edge of the water. Above ground on land, 3 males were found under a stone, under a stone, and among decaying leaves, 50 cm, 70 cm, and 70 cm from the edge of the water, respectively. 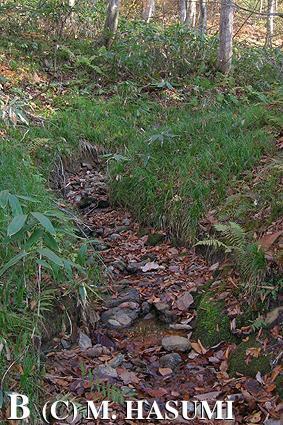 The water contained 1 juvenile of the frog Rana ornativentris and 2 males of R. tagoi. (C) A female immigrant after entering the water (anesthetized, ventral view), having cloacal swelling and four toes on both hindlimbs (body mass = 8.5 g, snout-posterior vent length = 71.42 mm). Accompanied Research Collaborators: Masaichi Kakegawa (Tokyo Metropolitan Komatsugawa Senior High School) and Fujio Kishi (Shirouma Association of Naturalists). Copyright 2006 Masato Hasumi, Dr. Sci. All rights reserved.